បាងកក គឺ​ជា​រាជធានី​ និង​ជា​ទីក្រុង​ដែល​ប្រជាជន​ច្រើន​បំផុត​នៃ​ប្រទេសថៃ. រជធានី​នេះ​ត្រូវ​បាន​ស្គាល់​ថា​តាម​រយៈភាសា​ថៃក្រុង​ទេព​មហា​នគរ(กรุงเทพมหานคร, pronounced [krūŋ tʰêːp máhǎː nákʰɔ̄ːn] ( ស្ដាប់)) or simply Krung Thep . ទីក្រុង​នេះ​មាន​ផ្ទៃ​ដី​ទំហំ​១៥៦៨.៧ គ.ម.ក្រឡា ស្ថិតនៅ​ដី​សណ្ត​ទន្លេ​ចៅប្រះយ៉ា ភាគ​កណ្តាល​ប្រទេស និង​មាន​ប្រជាជន​ជាង​៨​លាន​នាក់ ស្មើ​នឹង​១២.៦%​នៃ​ចំនួន​ប្រជាជន​សរុប​របស់​ប្រទេស។ ច្រើន​ជាង​១៤​លាននាក់​រស់​នៅ​ជុំវិញ​ទីក្រុង​ ដែល​ធ្វើ​អោយ​បាងកក​ក្លាយ​ជា​ extreme primate city, dwarfing Thailand's other urban centres in terms of importance. 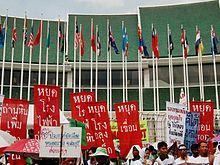 Protesters in front of the United Nations Building during the 2009 Bangkok Climate Change Conference—Bangkok is home to several UN offices. បាងកក គឺ​ជា​សមាជិក​នៃ​អង្គការ​អន្តរជាតិ​មួយ​ចំនួន​ និង​បណ្តាញ​​នៃ​ការ​គ្រប់គ្រងទីក្រុងក្នុង​តំបន់ រួម​មាន Asian Network of Major Cities 21, the Japan-led Asian-Pacific City Summit, the C40 Cities Climate Leadership Group, the ESCAP-sponsored Regional Network of Local Authorities for Management of Human Settlements in Asia and Pacific (CITYNET), Japan's Council of Local Authorities for International Relations, the World Association of the Major Metropolises and Local Governments for Sustainability, among others. ដោយ​សារ​លក្ខណៈ​ភូមិសាស្រ្ត​នៃ​ចំ​បេះដូង​នៃ​តំបន់​ដីគោក​អាស៊ីអាគ្នេយ៍ និង​ជា​មជ្ឈមណ្ឌល​នៃ​គមនាគមន៍របស់​អាស៊ី បាន​ធ្វើ​ឲ្យ​បាងកក​ជា​ស្នាក់ការ​នៃ​អង្គការ​អន្តរជាតិ និង​តំបន់​ជាច្រើន។ ក្នុង​នោះ​ផង​ដែរ បាងកក​ជា​ទីស្នាក់ការ​នៃ​លេខាធិការដ្ឋាន​នៃ​អង្គការ​សហប្រជាជាតិ​សម្រាប់​ស្ថានបេសកកម្ម​សេដ្ឋកិច្ច​និង​សង្គម​សម្រាប់​អាស៊ី និង​ប៉ាស៊ីហ្វិក(ESCAP), ក៏​ដូច​ជា​ការិយាល័យ​ប្រចាំ​តំបន់​អាស៊ី​ប៉ាស៊ីហ្វិក​នៃ​អង្គការ​ស្បៀងអាហារ​និងកសិកម្ម​ (FAO), អង្គការ​អាកាសចរណ៍ស៊ីវិល​អន្តរជាតិ (ICAO),​អង្គការ​ពលកម្ម​អន្តរជាតិ (ILO),​ សហគមន៍​ទូរគមនាគមន៍អន្តរជាតិ (ITU), ឧត្តម​ស្នងការ​​របស់​អង្គការ​សហប្រជាជាតិ​ទទួល​បន្ទុក​ជន​ភៀស​ខ្លួន UNHCR), និង​មូលនិធិ​អន្តរជាតិ​អង្គការ​សហប្រជាជាតិ​សម្រាប់ "'UN Children's Fund"' (UNICEF).